Mark Chapman in December, at the Shrimp Shack in South Carolina. NancyOnNorwalk editor Mark Chapman passed away suddenly Sunday night, after we arrived in Brooklyn to stay with our son. We had been planning to shop for an apartment today. Mark touched many, many lives in his career as an editor. He was kind, generous and a good teacher. I reached out to an old friend this morning and she reminded me, as I knew she would, that he had turned her life around completely back in the day. It was just Mark being Mark, she said. Mark’s parents were both deeply involved in the Cape Cod Melody Tent and he grew up in the company of celebrities and creative people. I am sorry that he never got to write that book he had been mentioning. He got into newspapers after meeting me 40 years ago at Smithville Summer Theater – the first time we kissed we were on the tent. He had been in theater but decided he needed a steady paycheck to support a family. He was a great father. We had many pets during our lives together and he was great to them as well. I think you know how much he taught me in the past few years. Mark worked for the Cape Cod Times, the Vero Beach Press Journal, the Wilmington Star News and the Boston Herald, to name a few. He was travel editor at the Herald, for about eight years, I think. He went to Alaska twice, visited the Caribbean and Canada and became something of a cruise expert. Then we went to Florida, to the Herald-Tribune. That led to an online-only newspaper, Englewood Edge, after the newspaper business started crumbling. Englewood Edge later spawned NancyOnNorwalk. He was a singer. That got rekindled during his cruise career and he set about getting gigs on Cape Cod, and occasionally Don’t Tell Mama in Manhattan. He was also involved in community theater on Cape Cod and was in a wonderful production of 1776. He liked to say we were married 35 years (or 36, or 37), and happily married for three (or four or five). That was true. He had a great sense of humor, as I sure many of you know. Everyone is asking what happened so I will tell you. He didn’t feel well but he wouldn’t go to the doctor. We were in New Jersey and our Connecticare health insurance was not valid. Well, it wasn’t gone. Last night he was shaking again, and died suddenly. That’s all I know. EMTs and doctors tried to get him back but failed. Mark was 63 years old. Mark certainly has made a difference here in Norwalk. I am so sorry for your loss. Our sense of humor were somewhat alike, even if some didn’t find us funny. I am sad we didn’t get to have that chat that I often asked you lately to have him stop by. From Norwalk, to baseball, to people who make you stop and think, Mark always made me enjoy his company. I will miss you Mark. Rest in Peace my friend. I will await your byline from Heaven. Peace be with you Nancy and your son. I never knew him outside of these pages on Nancy on Norwalk, but he seemed like a really nice, thoughtful, and intelligent person, the world and Norwalk needs more people like him. I am an avid reader of your site and please know that you & your family are in my thoughts and prayers. God bless and God Speed Mark. What a great contribution to society he was/is. Our thoughts and prayers with you Nancy, your family and friends. My sincerest condolences to you and your family. I didn’t know Mark personally, but your write up tells what a special man he was. May he be with you always. I am deeply saddened to hear this news. I shared a number of exchanges with Mark behind the scenes. He was always very kind. I am so sorry, Nancy & Eric. You will be in my thoughts in the coming days, weeks and months ahead. I’m so sorry to hear of your loss. Please take care of yourselves and return to Norwalk when the time is right. My condolences to you and your family. what a shocking loss. I only knew him through the writing on NonN which was crystal clear and honest – so rare and so needed. Heartfelt condolences to you and your family. My condolences; thoughts and prayers are with you and your family. Mark’s passing is a tremendous loss for so many people, on so many levels. This man was a giant – and I’m not trying to be my normal funny. Mark and Nancy put out Nancy on Norwalk EVERY day (until they finally took a few weeks of vacation). And they have done it on a shoestring budget. In my opinion, this website has had a profound impact on the level, intensity, and integrity, of political discourse in Norwalk. Further, I honestly believe that the business model for Nancy on Norwalk, challenged as it has been, might be the only viable way to sustainably report local news in print form while meeting a consistently high standard for content and journalism. Mark did it with humor, and pluck. And with grace. He even made it look easy, which it isn’t, What a mensch. Nancy and Eric, I am so sorry for your loss. Norwalk loves you, and we love Mark. Very sorry for your loss, Nancy; Mark will be missed. Wow, so sorry to hear of this news. No question Mark had a nose for a story and I always found him to be very fair and professional. Quite the courage to express these memories so soon Nancy. Rick, I’m sad, too. If we had gotten back to Norwalk I would have made him come see you. Nancy I’m was so saddened when I received the news. My deepest condolences on your loss. Mark was a true professional who reported the news with honesty, fairness, and integrity. Many times either in person or on the phone, Mark would ask questions on difficult issues and reported my answers accurately and without bias. He had a remarkable sense of humor that he shared with me often. He never let our respect for each other interfere with his honest reporting of the facts. His passing is also a loss for Norwalk. He will be missed. I know how devastated you are and my heart and the hearts of all you followers share in your pain. Mark Chapman’s warm heart, sense of humor, and passion for his life’s work will be missed. Mark believed so strongly in the importance of local news that he spent retirement savings for more than 3 years, and worked for free, to help create important, incisive coverage of city hall, education, zoning issues, and other matters of civic importance. He did so because he knew that local journalism makes a difference, and he was deeply concerned with ongoing industry-wide cutbacks in coverage. He believed that a journalist’s role was to “comfort the afflicted and afflict the comfortable.” He sacrificed mightily for this, his life’s work, and in doing so became the model of a life well-lived. Mark’s passion – together with Nancy’s – is visible in the difference that NON has already made in Norwalk via in-depth reporting on political hijinks, land use, and education reform. Mark’s death is a huge loss for his loved ones, for journalism, and for Norwalk. We are so sorry for your loss. Our thoughts are with you — Anthony, Paula, Sandy, Kate, Meri and Kelly at Norwalk ACTS. so sorry to hear this. Nancy on Norwalk has been such a valuable part of Norwalk community. Mark will be greatly missed. So very sorry for your loss. You have lost a husband, friend, companion and father. We have lost a great wit, thoughtful writer and fine editor. May your memories help you through this most trying time. I never knew Mark personally, but feel connected to both of you through NoN. You must be devastated, and I cannot pretend to know what you are going through. I offer all condolences, prayers and thoughts during this time and hope you and Eric find the strength you need. He will be missed! Nancy and Eric, our heartfelt condolences – this is so tragic, on so many levels. May your beloved Mark rest in peace, and know our prayers will hold the hope that you find a small measure of solace and comfort in knowing how many people your husband positively affected through his words and deeds. I for one will be forever grateful for what you and Mark have contributed to this city – through legitimate journalism via Nancy on Norwalk – that made it feel more like a community. Nancy and Eric, Kay and I are so sorry for your loss. Mark was a great guy and a first rate journalist. I will miss arguing with him about stories, editing, leads, headlines, and some of the other less interesting aspects of journalism. He truly helped change the way journalism is practiced in Norwalk. Nancy and Eric – I am so sorry about your loss. Mark was such a great person. His great wit, comments, kindness and his keen ability to raise awareness will be missed. Please let us know if there is something we can do to help you. You are in my prayers! RIP Mark. Nancy, I am so sorry for your loss. I would like to express my deepest sympathy during this time. Mark was a gem in our beloved community. His dedication to truth and fairness will be always remembered and deeply missed. Nancy and Eric, I cannot fully express how saddened I am to hear we’ve lost Mark. I am so grateful for the opportunity to really get to know Mark through the reporting on my campaign. He was one of a kind, filled with humor, wit and most importantly one of the biggest hearts I’ve come across. He will be greatly missed, both on and off these pages. My thoughts and prayers are with you two and all of Mark’s loved ones. RIP Mark – The legacy you have left will continue to make this city, and beyond, a much better place. I’m very sorry for your loss, Nancy. I never met him but feel like I knew him from this website. Our deepest condolences for someone who clearly evinced a love of life, a profound caring of his community and a firm belief in the value of the fourth estate. So sorry, Nancy, and such a sad a loss for for your family and our community. Our best to you and Eric. Peace be with you. Nancy & Eric, I am heartbroken by this news. The Duleep family will hold a good thought for all of you. Please let me know if there’s anything I can do for you. Nancy, my deepest condolences. I always loved seeing Mark’s rock-solid support and involvement with “Nancy on Norwalk” and the respect he received from so many in the community. Deepest condolences to Nancy and Eric. Norwalk has lost a real “Journalist” and “Newsman” who truly made a positive difference in encouraging better Governance. . So sorry for your loss, Nancy! My condolences to you and your family! And we were just getting to know each other. I want you to know that despite the occasional tempestuous discussions that occur on NoN, I respected Mark’s efforts to get to the core of an issue. I and my fellow members of the Norwalk Republican Town Committee are saddened by your loss and extend our deepest sympathy. I heard from several today and they each asked that I leave a message on your NoN blog. May peace be with you Nancy and your son Eric. Dear Nancy and Eric, please accept my sympathy in the sudden and heart wrenching loss of your husband and father. I echo the comments made by so many here. He touched so many lives and had such a profound impact on our Norwalk community, and we are going to miss him. His life was rich in all the ways that truly count – family, friends, values, life’s work, integrity, and legacy. In the end, the only thing that really matters, and the only thing that remains, is love. 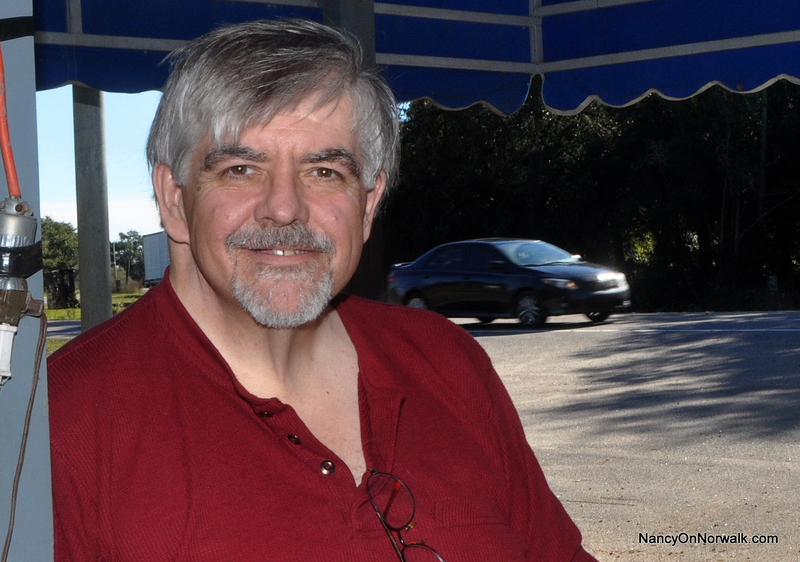 Mark Chapman had a life that was rich in love – given, and received. That love, and the memory of him, and his spirit, will always be with you. In the days, weeks and months ahead, when you are feeling troubled, never doubt that that love is still with you, and always will be. I am so very, very sorry for your loss. You are in my prayers and my thoughts. Nancy and Eric, I am so sorry for your loss. It is ironic indeed that Mark’s last Opinion piece (as linked by Bob Welsh above) defended the ideals of a free and vibrant press. He understood the importance of it, and as we all know, he was a damn good journalist. Norwalk, collectively, received very much from Mark’s work. Nancy, Bob and I are so saddened by the loss of Mark. All of our thoughts and prayers are with you and Eric during this time. What a nice picture of Mark by the Shrimp Shack. Brought back memories as we were just in Hilton Head, SC. Please take care of yourself. We will be thinking of you. Nancy, very sad to hear of you loss. Over the past six months I have greatly enjoyed reading Marks writings and thoughts. Nancy & Eric- very sorry for your loss. Please let the readership know if we can help out your family. I am so sorry for your loss. 🙁 my thoughts and prayers are with you and your family. Nancy, Eric and family…. so sorry to read about Mark. My thoughts and sympathy to out to you and everyone who will miss him terribly. He will always be in your heart. I’m so sorry to hear of your family’s sudden loss. Please don’t hesitate to reach out for support if you need it. Nancy and Eric I am so very sorry for your loss. I am among the many who have weighed in here already and who – though never having met Mark in person – felt as if they had come to know him through his wonderful writing, his comments in response to reader’s comments, or through exchanged emails. What shined through in all of these communications was the amzingly bright beacon of Mark’s character, which “Wineshine” highlighted when he said that he felt that he was “‘speaking’ with a fair, and honest man of great integrity.” I am saddened beyond words and am so, so sorry for your loss. may tell us like it is, under his byline from Heaven. Norwalk has lost one of the seekers of Truth, Justice and the Nancy On Norwalk Way. The wit that he put into his editorials will be missed by me for sure. I change a quote I said when MY father passed on… “Do not mourn Mark, Mourn the masses that never met him (or read his work).” My thoughts are with you. Nancy, so very sorry to hear this. My deepest condolences to you both for your loss. Please take care. Very sorry to hear of your loss. I enjoyed my conversations with Mark, finding him to be a fun guy to banter with. He gave as well as he received, and I know from some of the things he said how much he loved you and Eric. Nancy, I am so sorry for your loss. Nancy & Eric – We are so terribly sorry for your loss. Christine and I are totally stunned as you must be as well. He was a truly wonderful guy and he will be terribly missed. Sincerest condolences to you both and your extended family. Norwalk lost a great newsman. If there’s anything we can do please don’t hesitate to reach out. My deepest condolences to you and your family. You are in my prayers. On behalf of the PTOC we express our deepest condolences. Nancy and Eric, I am so very saddened and sorry for your loss. It’s a terrible loss for all of us in Norwalk, too — even those who don’t realize it. We were lucky to have Mark for the time we did. He really made a difference. And how you (Nancy and Eric) managed to come out with news stories today is nothing short of awesome. Sending you very best wishes at this difficult time. Mark, may you be in heaven an hour before the devil knows you’re dead. Great man. We will miss you. I am particularly moved by the fact that Mark’s final opinion piece was a fulsome appreciation of John Oliver’s homage to the importance of: 1) honest; 2) thoughtful; 3) local… journalism. I hope that time before he passed, Mark felt the warmth of that sincere appreciation of his work — indeed his mission — for which he sacrificed so much. My only interaction with Mark was via email, in which I quibbled with him about a quote or a way of phrasing things that I didn’t think was quite right. He always responded with a sincere and open appreciation of the thought I was trying to convey, and sometimes he agreed with the point I was making and edited accordingly. A real open mind is a truly rare thing, and our world is that much poorer for having lost the active energy of this remarkable mind and spirit. Norwalk is an odd place. Endearingly odd in some ways, but odd nonetheless. Not everyone appreciates it for what it truly is, but I think that over time, Mark got it. The fact that he did so may not have changed his life, but it certainly enriched ours, and I am thankful for that. Nancy and Eric — your loss is unfathomable. It is shared by many, but truly understood only by you. Please accept my sympathies for your loss, which is forever and uniquely yours, but shared in some small way by more than you could ever know. So sorry for your loss. I’ve enjoyed your dedication and impartial coverage of Norwalk and the sometimes crazy things that go on here. I’m not sure if Mark would find it ironic, funny or appropo that I learned of his passing while reading the half-Hour. It was shock and then immediate & profound sadness that overcame me, reading and re-reading the story, as if I could blink it away. But of course I had to find my way over to NoN, in hopes the news was simply not true, or some cruel joke. Words cannot express how my heart aches tonight, for you and for Eric. This amazing chapter in your lives coming to a close on some level, on your terms, and in your own time. I can only say that having had NoN here made me an even more engaged resident, and I think Norwalk a better city. No matter what the future holds for you, I hope that in the days ahead you find comfort with the happy memories of Mark, and knowing that your Norwalk family admires and respects you. And surely grieves with you. Nancy, I just found out about your terrible loss. Mark was your love, your support, our friend to so many. I can,t find the words to express how saddened I am. If you need anything please let Dan and I know. Prayers are with you and Eric. Memories will give you strength in the days to come. “Fair and balanced” in the truest sense of the phrase, Mark will be greatly missed. His legacy, and yours as well Nancy if life takes you in a different direction (we hope not), is better government and transparency in Norwalk. And that is a legacy any journalist would be proud of. The great film Spotlight comes to mind. Our deepest sympathy in this tough time for you and Eric. May God confort you in this difficult time. RIP. Klaus and I can’t find words to describe your loss. Our prayers are with you. Sandy and Klaus Schmitt. I am so sorry for this immense loss. Nancy and Eric, so sorry for your loss. I have mo words. So sorry. So sorry for your sudden loss. Was out of town Monday, could not sleep Tuesday early morning…so what to do? Check on the early morning NON Newsdown! When I saw the headline this morning, I was shocked, then so saddened to find out about Mark’s untimely death. Nancy, please know that while Mark could have a sharp tongue to match his sharp wit, he would often seem to melt into a young kid with a crush when he spoke of you…a true love like that is indeed so hard to find. Another memory that stands out is how Mark would light up when almost any conversation would be compared to some theatrical reference. Mark understood the drama playing out on the stage of local and national life! Peace be with your family in this time of sadness. Nancy, my condolences to you and your family. Thank you for sharing his wonderful story. My prayers are with you and your family during this difficult time. Nancy, I’m so shocked and sorry to read this news this morning. You two always seemed like a real couple, partners in real life. You had such a love and will miss him so much. Mark left his mark on our community and we owe him a debt of gratitude for that. That light is something Mark with skill and a keen sense of humor helped to keep shining in Norwalk. Hopefully, in his honor, we’ll do all that we can to see that it doesn’t begin to dim now that he is gone. Nancy, I have been privileged to know Mark since the 1950’s. I have always felt it an honor to call him a friend. My thoughts and prayers go out to you and your son, as well as your entire extended family and friends who were also touched by his articulate wit and wisdom. RIP my friend. Nancy, you Mark and Eric have made a huge difference to our community, and Mark leaves an equally huge hole. I wish I had known him better, but the few interchanges we had proved him to be enlightened, honest and brimming with integrity. I am tremendously impressed that in your grief you are able to post these much-deserved comments. I will miss Mark’s commentaries very much. Nancy, My thoughts and prayers go out to you . Although Mark’s passing will leave a gaping hole in your heart, I hope treasured memories will comfort you. Our very deepest personal condolences to the Chapmans. This is a monumental loss for all of us here–and not just for the citizenry, but on a larger canvas for journalism. Under Mark’s leadership, the Chapmans have kept us on the path to truth in reporting. Without you, we will find the going nearly impossible to keep up with the all sides of the churnings of local issues. We hope you will have the strength to continue Mark’s work. Whatever happens, you have our deepest appreciation and our heartfelt condolences. Peace be with you at this most difficult time. The one time that I met Mark, we had a great conversation. He was witty, compassionate and upbeat. Please know you and Eric are in my thoughts and prayers during this difficult, difficult time. Please let us know if there will be a service in this area. I am so sorry. My sincerest condolences to you and your family. Mark will be missed. Nancy and Eric sorry about your lost. May God bless you both and keep you well. Our thoughts and prayers are with you and your son. May Mark rest in peace. He was a good man. Sorry for your loss, although I never met him he seemed link a nice guy. Sorry for your loss. He will be missed by many. How terribly sad – of course and in every way for you and the family, but also for all of us who depended upon his thoughtful and diligent reporting and commentary. Thank you for sharing with us, Nancy on Norwalk’s family of readers. I, like so many others, was so saddened to hear of your loss. I first met Mark when I was campaigning last year. We spoke then not just about Norwalk, but about many other things as well, including our lives and families. I was then, and continued to be, impressed by his warmth, compassion and professionalism. You both have made a real difference to our community and Mark will be truly missed. Unfortunately I never met Mark. The two of you brought daylight to the often dark corners of the political process. Nancy, may you have the strength and fortitude to continue NoN and enlighten us. I will always think MaN when I see NoN. Nancy, Eric – I can only add my name to this long list of friends and admirerers. We will miss your spot-on reporting and sense of humor. RIP. What a beautiful and poignant epitaph you have written for your husband, Nancy. What a life loving (and loved) soul he had; wish that I could have met him! Though I have enjoyed reading his pieces in NON, perhaps your mutual Magnum opus. I’m sorry for this huge and unexpected loss for you, your family, his friends, and Norwalk. Nancy and Eric, I too never met Mark in person but often know people better through their work. He was a man of intelligence, wit, and kindness and will be sorely missed. We are so sorry to learn of the passing of your beloved husband, Mark. He was an inspiration to us and a true journalist. Reading his comments made us feel like we knew him personally even though we never met him. We are definitely going to miss him. Also, our condolences to your son, Eric. Our thoughts and prayers are with you both. As with everyone we were shocked and saddened by Marks untimely passing. Nancy: I am so sorry to hear of Mark’s death. Losing your best friend and partner after 40 years must be unspeakably difficult. I don’t know how I would cope with a similar loss. Both Stuart’s and my thoughts are with you and Eric. Every time I met Mark or read an editorial, I thought how smart and clear he was. He was honest and had great integrity. He will be missed. But I hope his loss does not mean the loss of Nancy on Norwalk. It will be different without Mark, but you are smart, honest and have, after all, worked with the best. I hope that you can continue. All that Mark gave you, his support, love, honesty, humor and wit are still there within you even if he is physically gone. Thank you for the comments. It does help me to see people appreciated my dad.. even if I keep crying when I read them. I’m going to post something myself, when I can finally get my thoughts together. Sorry for your loss Nancy. My thoughts and prayers go out to you, your family and friends. Never met Mark but he clearly had a lot of Decency to him. Rest in Peace Mr Chapman. Just reading this sad news. Convalescences to the Chapman family during this difficult time. Having been on the board of NON, I had a chance to see how tirelessly Mark worked to get Nancy On Norwalk properly set-up and organized. He was smart, capable and dedicated to journalism. Mark always spoke of you both with great warmth and pride. He was particularly proud of you, Eric, for all your contributions to NON and how skilled you are on the computer. Nancy on Norwalk changed our city. It gave us the news we really needed, and the views we couldn’t get elsewhere. This is a terrible, terrible loss both to you and our community. This is such sad news, Nancy I am so sorry for your loss. Mark’s personality shone through in his work, and he brought an amazing passion and dedication to keeping Norwalkers informed. I am so sorry, what a tragic loss for you both. Mark really was a “pillar of the community” and will be missed by us all. Eric – your Dad was and always will be know as a great man. I only spoke with him a few times at your after hours musical/fund raisers, but they were never short conversations. Likely because I, like so many others, really got to know him through his articles and posts on NoN. His concern, clarity, generosity and insight into what’s happening locally, coupled with his easy manner invited us all to take part – a rare gift. God bless you both in this difficult time. So sadden by your lost, I know he will be missed, God will give you the strength to continue.Please accept my condolences; thoughts and prayers are with you and your family. Nancy, I pray you find comfort in all the great memories you and Mark created. He will certainly be missed and his writings live forever. You have both been in my thoughts and prayers throughout these days. Nancy, know that you and Mark have touched my life in many ways. You are a team in the best sense of the word. My hope is that all the love, gratitude and admiration expressed for who you are and what you do seeps in and comforts you in this new part of your journey as family. Know you are loved!!!! Mark, along with Nancy have made a significant contribution to Norwalk. Time has come for us, all, to contribute back. the expenses. Thank you all in advance for showing your appreciation for all Mark has done for Norwalk. Time to step up Norwalker’s, time to show your character, cmon lets help Nancy, she needs our help. You will be missed Mark. So very sorry for you and your family’s loss. We will all miss his truthful and extensive reporting of issues and stories in our community. He enlightened so many and was a good person who cared. Remember all the happy memories. The terrible loss to your family is also a terrible loss to our community. NoN has shone a light on Norwalk events – from the controversial to the informative – made the readers more aware and vested in the city’s success. A thankless job, one of those “someone has to do it” things. Well, Mark did it, and we were all better off for it. He will be missed. Condolences. Praying for the family. Nancy, when I started sadly sharing this news with former coworkers at the Herald-Tribune, every one of them mentioned Mark as “a good guy,” a supportive boss and a wonderful storyteller. He cared so much about his writers, especially the young ones. He made a difference in so many people’s lives both in and out of the office. I will miss him very much and send love and prayers your way. Thank you all. The surreal is becoming tangible and I have a lot to deal with. This is going to take a while. All these comments and prayers have helped. Nancy & Eric – I am so very sorry for your loss. Even though I never met him, Mark seemed like a great guy and I really admired his hard work and dedication to publishing quality journalism. Prayers are with you all during this sad time. I am so sorry about Mister Chapman passing. He was a well versed, sophisticated ,intelligent gentleman. I surely will miss his bright eyes and smile! We are so sorry to hear of the loss of your husband Mark. Please accept our sincerest condolences. May you find strength to get through this difficult time and may you find comfort in fond memories. We are so sorry to hear of Mark’s passing. Clearly from the sentiments expressed from every corner of the community and the Journalism industry, Mark impacted so many, so deeply. For those of us who have appreciated all of the Norwalk news and views that you both have brought to our attention, we will miss him and his input on a regular basis. How sad that he felt he couldn’t get medical attention, due to being outside of Connecticut without out of state coverage, a critical consideration in this tragedy. Dear Nancy and Eric… I only now heard the awful news. I’m terribly sorry. The comments on this terrible announcement are a tremendous, incredible gift to Eric, me, Mark’s legacy and our family. You have helped us get through this challenging time thus far and made a difference in our lives going forward. Thank you. My condolences on the untimely passing of your beloved family member Mark. You have done superb work on Nancy On Norwalk, and Mark will be long remembered for vastly improving communications and journalism in Norwalk. We are so sad to hear the news about Mark. He was a true friend and always enjoyed traveling with him on the boxing circuit. He was always supportive and very truthful with his words even no matter how much it hurt sometimes but in the end it was the words needed. I have never taken a cruise with my family due to the fear of water however my first and only cruise was with Mark on one of his journalist adventures. Lori would keep me up-to-date with Mark through all the news he was writing after you had moved from Cape Cod. We have had many laughs and will truly miss Mark. If he was your friend he was a friend for life. Nancy and Eric we send you our condolences and will try and get in touch with you soon. Thank you all in advance for showing your appreciation for all Mark has done for Norwalk. Time to step up Norwalker’s, time to show your character, lets help Nancy, she needs our help. Terry – I tried to contact you to let you know. You were also in our thoughts: I was hoping we’d see you on a visit. I am so sorry to hear of your devastating loss. May your memories bring you comfort. Nancy and Eric, I am very sorry for the physical loss of Mark, though I know he will always be with you in spirit. I very much enjoyed his style of writing and his style of editing. Over all else he appeared to be genuine. It was a pleasure working with him and I will sincerely miss him for all he brought to the craft of writing. My condolences on Mark’s passing. May these tributes bring you comfort and peace. You are in my thoughts and prayers.